Once I arrived in Nairobi, after 18 hours of flying and a day in London, I hired a young guy named Philip for taxi service. He took me to the Hotel Boulevard then picked me up at noon for lunch at “The Carnivore” restaurant. 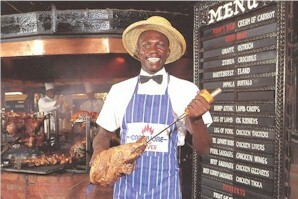 Yes, it has zebra, eland, crocodile and ostrich in addition to the usual beef, pork and chicken. They put on such a show! The waiters (all male) walk around with meat on spears and slice a bit off so that it drops on your plate. This is definitely a must stop site on your jaunts through Nairobi. Philip and I spent the afternoon touring Nairobi. Met up with my tour group, 13 people plus three guides. 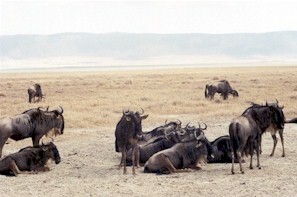 The company I chose is a British outfit that has 63 African safaris each year. Most of the group was from London, two from other areas of England, two from Scotland, one from Ontario and one from Chicago. We had 5 single women, 2 single men and 3 couples. We had to break down our own tents in the morning and put them up in the evening. We also rotated camp duties — cooking, stools, water, table, tents, dishes, pots, etc. The trip was very well organized. 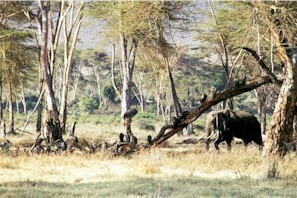 The second camp at Karatu was the last of the hot showers for four days. The camps got more primitive as we went. 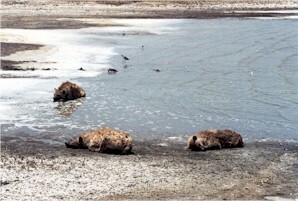 Ngorongoro was on the crater, 35 degrees and only long-drop toilets. Plus it was 2,000 feet elevation and boy did I feel it! 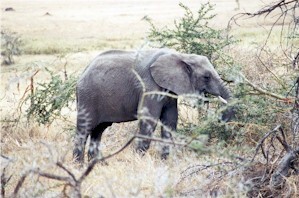 The camp had elephants on its perimeter and we heard lions growl. 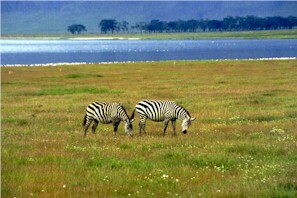 Guards with rifles patrolled and zebra came through the camp during the night. 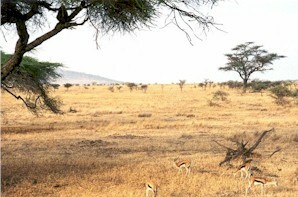 On the Serengeti, we camped at open sites with no showers and only long-drop toilets. They were so bad that we squatted in the bush. We had to wave flashlights to scare off the animals. 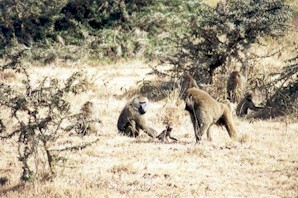 And we used sling shots with stones to scare off the baboons. 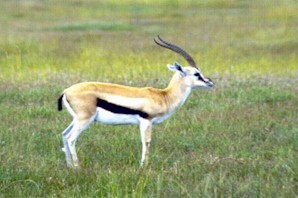 During the night, impala and gazelles went through camp. 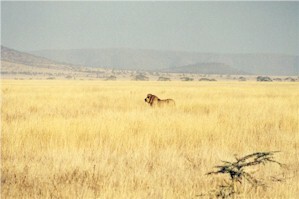 Most of the camps were run by Maasai tribes, so they patrolled. Everything is covered with dust, you get used to it. 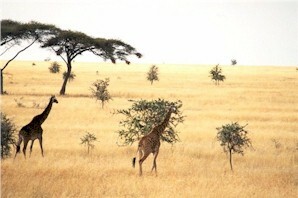 Many people stay in the lodge on the Serengeti, but we got the true feel of nature at its glory! 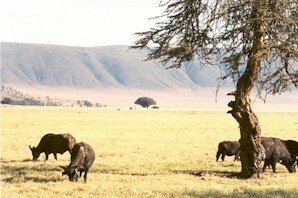 The Ngorongoro crater is the largest intact extinct volcano in the world. 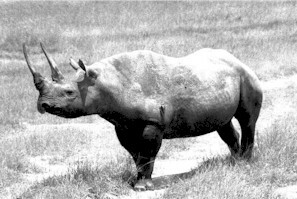 It’s been extinct for 100,000 years. It’s roughly 20 miles across on the crater and has its own ecosystem. 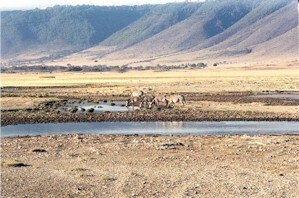 Most of the animals stay all year and actually migrate in the crater. We spent an entire day in the crater. 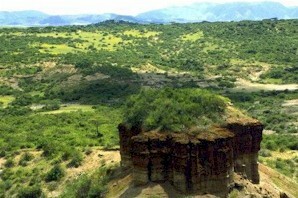 At the north end of the Serengeti is Olduvai Gorge, which is a steep-sided gorge, about 30 miles long and nearly 300 feet deep. The gorge was created by earthquake activity, and the deposits exposed in its walls were formed in an ancient lake bed and are more than 2 million years old. 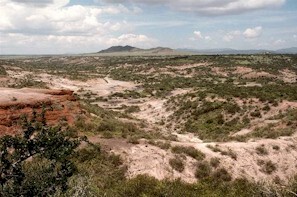 Stone tools, building sites, and bones of early hominids were uncovered here by Louis & Mary Leakey and others. The pictures tell all. What a beautiful country! Four people could ride on the top of the truck, so we took turns. 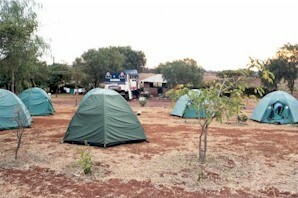 Camping in the bush is definitely the way to see Africa! 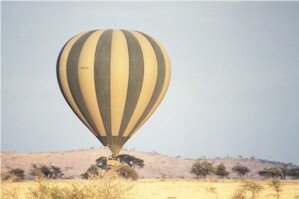 Two in my group took the hot air balloon ride over the Serengeti. 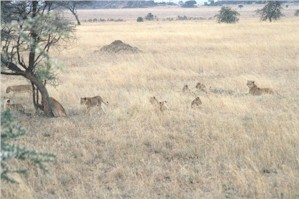 And we saw many lions in the bush. 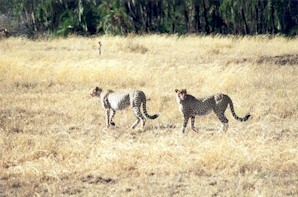 We finally found cheetah. 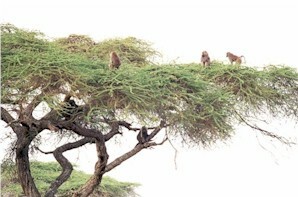 They we just finishing breakfast and a group of vultures were ready to take over. So they strolled away and parked by a tree for the rest of the day. 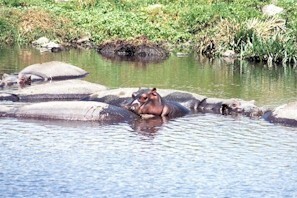 The only animals we did not find were leopard, but that’s understandable since they are quite elusive. Tanzania has 120 different tribes that have their own language. The official national language is kiswahili. 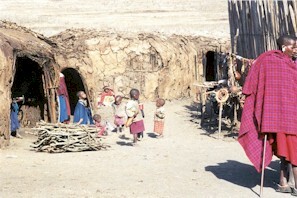 One of the tribes, the Maasai, are quite nomadic. They have small villages and raise cattle. Many roam the country. 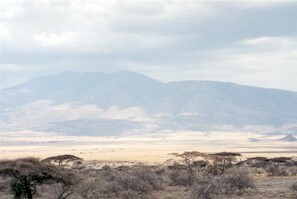 The Maasai are the only tribe allowed to roam freely between Tanzania and Kenya since they are so nomadic. The huts are made of cow dung. 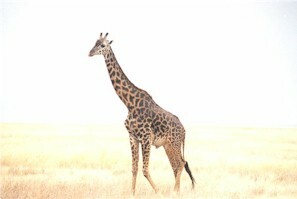 I was extremely impressed with our safari guide, Emanuel. Tanzania, as well as Kenya, is third world and poverty is the norm. Tanzania has seven years free education but most people cannot afford to buy the uniforms for their children. Or pens — we had many children begging for pens. Emanuel was lucky to have attended the primary seven. He also was able to attend secondary, even though it is very, very expensive. His downfall was not having learned enough English to keep up. 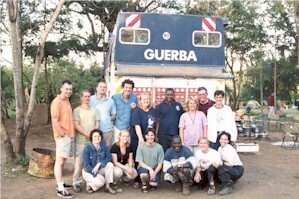 He joined GUERBA, a British company that puts together the safaris, five years ago and worked very hard at his English. I thought he must have been educated outside Tanzania. He is very conscientious of all the participants and keeps a very good eye on sanitary and safety. 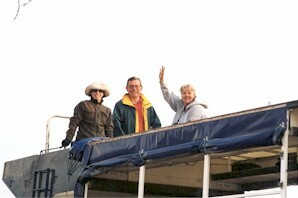 Above all, he is so enthusiastic about the safari and us that it rubbed off on the whole group. I hope you enjoyed it too!!! !